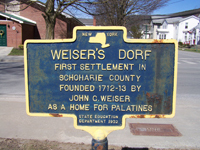 Johan Conrad Weiser established the first Palatine settlement in the Schoharie Valley in what is now the Village of Middleburgh. The generally accepted time that this happened is the fall of 1712. Weiser’s Dorf, as the settlement became known began with about forty log and mud huts running along Schoolhouse Creek from today’s high school to a point opposite Memorial Park. The Palatines knew the creek as “ketch” meaning chalice or cup. Up until the Revolution the houses and outbuildings were improved from their humble beginnings. In 1732, the first Dutch Reformed church was constructed. By 1760 there were several local tradesmen although a trip to Albany or Schenectady was required for certain items. School was held either in a crude log schoolhouse or a barn with lessons taught in German, Dutch and later, English. In 1777 during the American Revolution, The Middle Fort was constructed about three quarters of a mile north of the village. The Johnson-Brant raid on October 17, 1780 destroyed the village, including the church, as its residents took refuge in the fort. Johnson’s report described the village as houses on one side of the creek and orchards and fields on the other. One of the few structures in the valley that survived the raid in the valley was the Zelie or stone house. The primary structure was heavy stone walls. The wooden parts were replaced after the war. It would serve as residence, Town Hall, and Jail until 1883 when it was torn down to make way for the Union Free School. It was located approximately where the High School Auditorium is today. After the revolution a new Dutch Reformed Church, which still stands today, was constructed nearer to the Middle Fort. The reconstructed village grew up around it as it was also near a ford to cross the Schoharie Creek. This area was the business district during the early 1800’s. Michael Borst would construct a hotel and his residence, built in 1790, would later be used as the Reformed Church house. There was a nail factory, bakery, and general Merchandise business in this area. A school was located across the present Middle Fort Road from the Reformed Church. Several buildings from this period are still there today. H. D. Wells in his recollections recalled that the people living in this area referred to it as “Hudson” for a reason that nobody seemed to know.